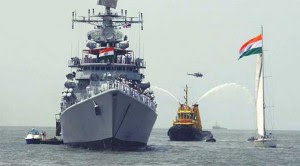 The Indian Navy hosted the first ever eight-day long multi-national naval exercise at the Andaman and Nicobar Islands. The exercise called "Milan" held in the backdrop of imposition of state of emergency in Maldives and Sri Lanka, two of India's maritime neighbours, and China's growing assertiveness in the region.. The military exercise, with the participation of 23 countries, was organised with the theme of "Friendship Across the Seas"
Almost 28 warships including 17 from India and 11 from Australia, Bangladesh, Indonesia, Malaysia, Myanmar, Singapore, Sri Lanka and Thailand participated in the exercise to expand regional cooperation and combat unlawful activities in critical sea lanes. Oarticipation of 39 delegates from 16 countries, made it the largest gathering since its inception in 1995. Exercise MILAN was first held in 1995 with five participating nations; India, Indonesia, Singapore, Sri Lanka and Thailand. The aim of the initiative was to have an effective forum to discuss common concerns in the Indian Ocean Region and forge deeper cooperation among friendly navies. Since 1995, the exercise was conducted bi-annually except in 2001, 2005 and 2016. Where was Milan naval exercise conducted? Which of the following was a mega naval exercise conducted by Indian Navy with the participation of 23 nations?